Not all bridges are pretty, but this one is gorgeous | Where to next? The weather has been glorious this week in Paris—much better than the rainy, grey days we had when we arrived in August. So it’s been good times for taking outdoor photographs. 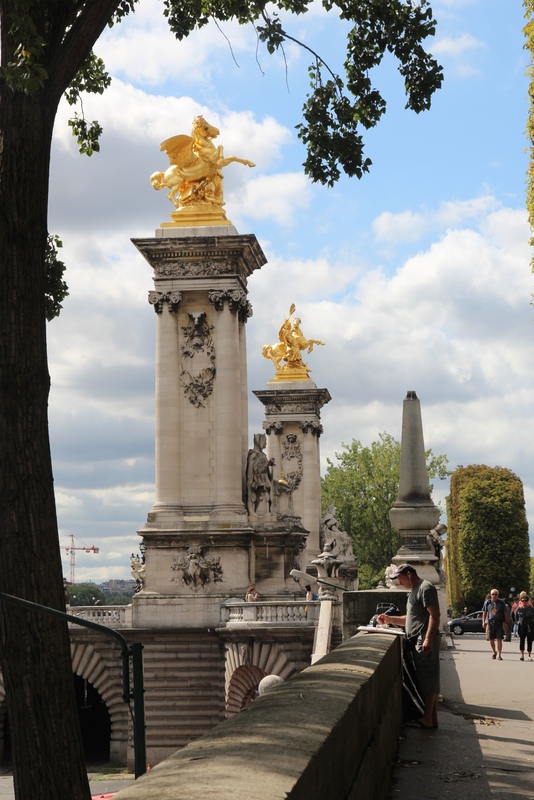 Poor John decided that the Champ-Elysées and Pont Alexandre III were perfect places to start so off we went to see Paris’ most famous street and prettiest bridge. The grandness of the Champs-Elysées is a little hard to capture on film when the streets are primarily crammed with tourists and lined with big-name brand stores. So this is a tribute instead to the bridge. 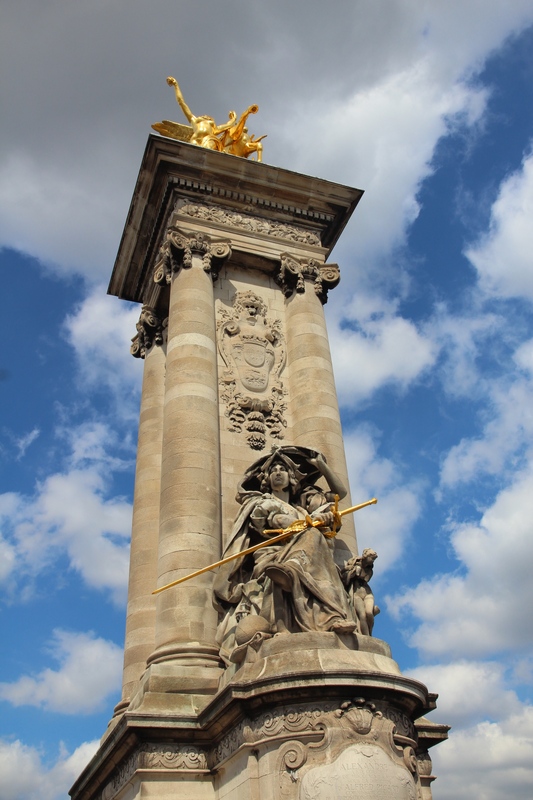 Built between 1896 and 1900, the Pont Alexandre III commemorates the 1892 alliance between France and Russian. 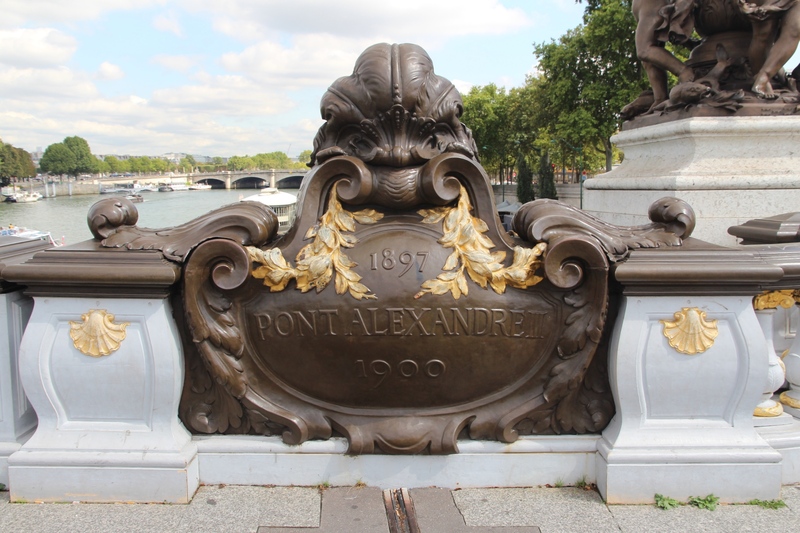 It’s named after Tsar Alexandre III, who laid the foundation stone in 1896. The bridge is a lavish structure with Art Nouveau decorations. There are gilt and bronze lamps, cupids, cherubs, nymphs and winged horses at either end. 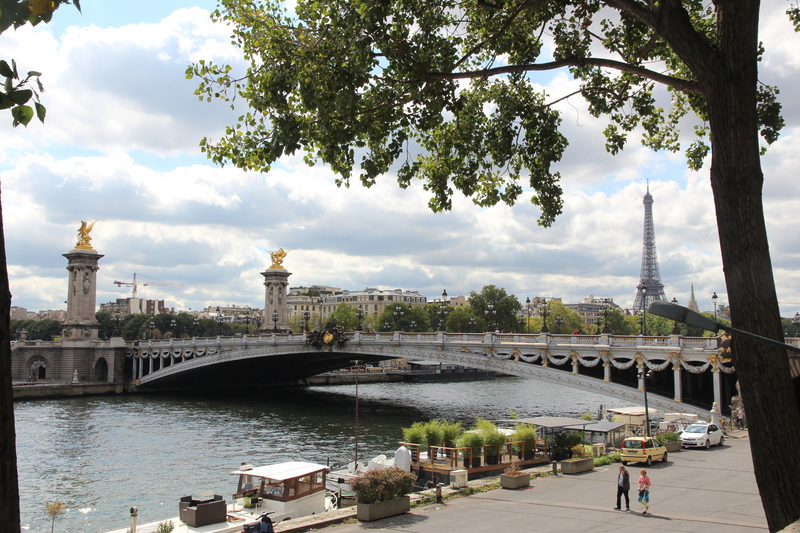 It’s easy to see why it’s considered the prettiest bridge in Paris. It was also considered an engineering marvel of the 19th century. It’s consists of a 6-metre (18-foot) high single-span steel arch over the Seine River. The design had to comply with strict controls that prevented it from obscuring the view of Champs-Elysées. We walked all the way across and then all the way back, and weren’t once accosted by souvenir sellers or the scammers who want you to guess which cup the ball is under! That made it even prettier in my opinion. If you’re a fan of all things pretty, here’s a good-looking salad I made for my cooking blog. ← Sculptures leaping off citadels? What will we see next? I hope you are able to visit there soon. And that the weather is good that day too. You have a good eye for appreciating beauty around you that other people would pass by. I only stopped over in Paris at night to the Lido so missed its daytime beauty. I do remember a scary taxi drive to the airport in the morning. They drive like they are attached to the bumper of the car in front. No allowance for braking distance etc. and at high speed. I was almost wishing for the brown paper bag the airlines have. Have they improved since the sixties? I haven’t ridden much or driven at all in Paris. But we hired a car to drive from Lyon to the south. I found the drivers in that part of the country remarkably courteous and tolerate, which was a huge relief. It’s really beautiful. I would love to see it in person. Hope you get there—and on a sunny day. spectacularly beautiful day – almost looks like you photo-shopped the sky! The sky was especially cooperative and I liked that the trees were leafy too. You are right Peggy. It is a really beautiful bridge. Thanks for sharing the photography and the info you put in the article. Keep snapping those pics! Thanks for stopping by. I’ll do my best to keep snapping. Wow. I’m surely going to visit this place… someday! I bet that was a wonderful trip. You’ll have to do it again someday. I hope so! The beaches were really nice. Don’t know if I could handle going to Amsterdam again 🙂 Mount Blanc was incredible would really like to go back there at some point in my life. I have to say that if you want really good beaches, you should come to Australia. I’ll show you some of the finest. Thanks for the wonderful pictures. Wishing you a happy weekend. Wishing you the same. Thanks for dropping by. I love bridges and this one is really awesome 🙂 !!! Yep, I agree. It’s a really awesome bridge. I love bridges too. Thanks for stopping by. Thanks. We loved seeing the bridge and sharing the images. 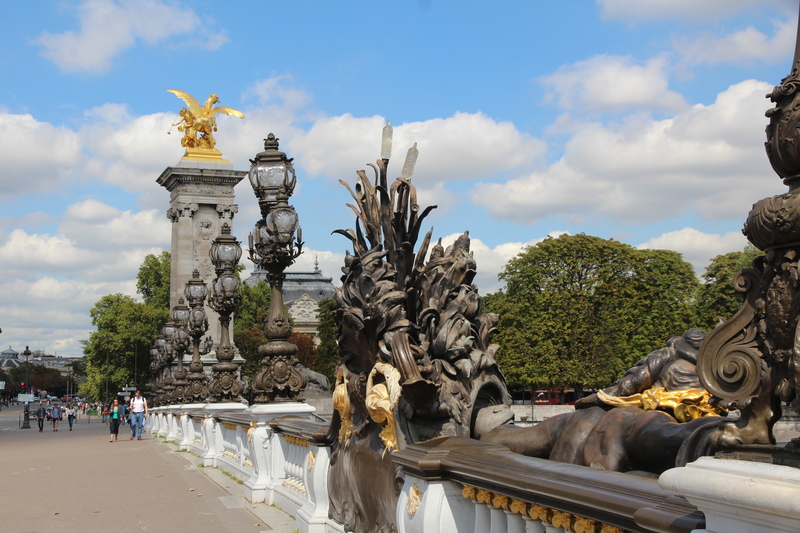 I love the gilded statues in Paris but was totally unaware of the bridge. Nice article. Wow! I’ve been here, and your photos look even BETTER than the real thing. Amazing! Wow, thanks for the high praise. Absolutely! You deserve it! These photos are absolutely beautiful.